Two weeks after Tree of Life Ministries presented the Round Hill Town Council with a plan to build 32 micro cottages for low-income residents on a former motel property near town, neighbors are making their opposition to the proposal known. More than a dozen residents attended the Round Hill Town Council meeting Thursday night to voice their opinions on a development proposal for the 7-acre Weona Villa Motel property, which sits just outside the town’s corporate limits. Many homeowners in the Lakepoint Village neighborhood, which abuts the motel property, made it clear that they were opposed to the project and concerned about increased traffic and the people who might move in. Paul Smith, the nonprofit’s founder and executive director, on Feb. 7 requested the Town Council extend municipal utility service to the property so that he could set up a micro-cottage community for low-income residents, with an initial focus on the elderly. To do that, the town and county governments would need to agree to update their comprehensive plans to include the property in the Joint Land Management Area—an area outside the town limits where the town provides water and sewer service, as it does Lakepoint. Michael Lannon said that he was worried the project for low-income residents could increase crime rates in the area. He said that was a concern because of the property’s location near Franklin Park, where many youth activities take place. “We would be quite concerned about how that community would be established and what that property would be used for,” he said. Tim Newman, a homeowner on Lakefield Road, said that he’s concerned about increased traffic that could make pulling onto and off of East Loudoun Street even more of a hassle than it currently is, noting that it’s gotten worse during the three years he’s lived there. “It’s going to affect this community greatly,” she said. P.J. Weber requested the Town Council not extend utility service to the property until Tree of Life identifies exactly which types of people would live in the micro-cottage community. He said that while the Round Hill community is “gracious” and “giving,” he wants to know more about the proposal. “I think the standard has to be set in stone—we have to know what this is going to be,” he said. On the other end of the debate were a few residents who felt that the nonprofit’s proposal should be given consideration. Eric Herschsaid that, while he would like to see more information on the proposal, he likes what the nonprofit is doing. He said that it makes sense for senior-housing to be located close to towns because it gives the them access to amenities and tend to be less confining than nursing homes. “They need independence and want independence,” he said. 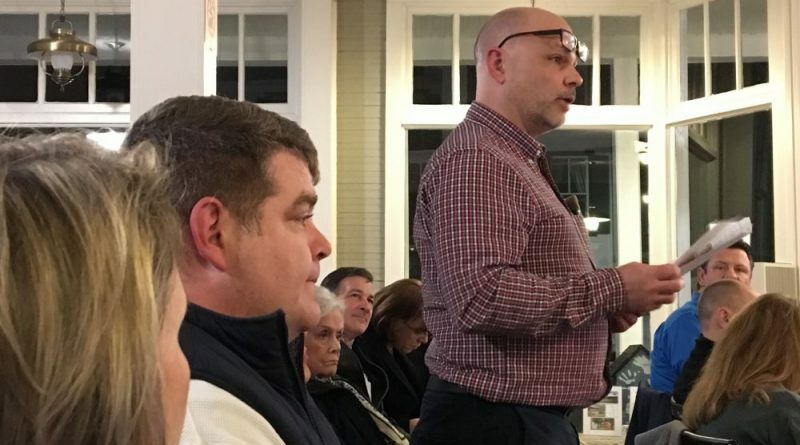 Jeff Fitzgerald, a member of the Round Hill Owners Association board of directors and a friend of Smith’s, said that while he’s not yet in favor of or opposed to the micro-cottages, Tree of Life lends more help to those in need than what meets the eye. Also present at the meeting to speak in favor of Tree of Life were the nonprofit’s chief program officer, its communications manager and the leader of its special needs ministry, all of whom urged residents to take a closer look at what the nonprofit does to help the community. Smith addressed the residents once they had all said their piece. He said that the project is still in the “very preliminary stages” and that the micro cottages would not be structured as a group home, but as an independent living buildings. He also mentioned that there are small, single-family homes along Tedler Circle in Lakepoint Village that somewhat resemble what the cottages might look like. “I want to listen to the points that are being made,” he told the residents. Councilwoman Amy Evers cautioned that a Comprehensive Plan amendment shouldn’t be tied to one specific organization out of fear that it might be perceived as being approved solely because council members like that the organization does good in the community. The council moved a vote to refer a Comprehensive Plan amendment to the Planning Commission to its first meeting in March. “Keep those low income criminals away from us and our children..” Round Hill doesn’t sound too “gracious” and “giving” to me. Preserve that space to pack in identical $700K townhouses. Criminals can’t afford to live there. If u read the previous article regarding this situation u would see that this is being modeled after Greenwood Ave Cottages in Shoreline, WA. That development has been called an “urban slum” as well as an “over glorified trailer park”. Would u like to see that at the entrance to your neighborhood?? Probably not! Secondly, the people moving in have nowhere to go. There are no sidewalks, bus stops, shopping, or anything needed for living nearby. They will essentially be landlocked on their own little island. There is a major traffic problem at the entrance of Lakepoint & Lake Road. Having another development of primarily walking residents will be not only a hazard to these pedestrians but also to drivers. It’s easy to call Lakepoint residents rude, uncaring & unwelcoming but this goes far deeper than just the typical “all they want is rich people as neighbors “. Until u live there don’t pass judgment. As I’ve mentioned before, Paul Smith has lots of his own land including “Serene Acres”. He’s far richer than us, maybe he should save the world on his own land. Lack of easy access to town by walking or transit- good reason to be concerned for residents that may want to make this their home. Keeping the “riffraff” out, not so much. It amazes me how people seemingly think “riffraff” is a good thing….I guess it’s a good thing if it goes in next to us & stays far away from your neighborhood right?!?! Easy to pass judgement when you’re not staring this in the face. Good on Paul for trying to bring light in a a darkworld. Clearly from the above comments, many of you have forgotten the importance of empathy and kindness. God forbid someone tries to do some good in this world, by aiding the Elderly and those in need. Good on him, and maybe the rest of you could use a little altruism in your life.